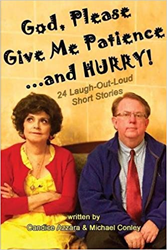 Publisher Avi Gvili of Boulevard Books proudly announces the new release of the hit comedy book called “God, Please Give Me Patience…and Hurry!” written by actress Candice Azzara and TV sketch comedy writer Michael Conley. “I learned to have more patience writing “God, Please Give Me Patience…and Hurry!” than it took to play Rodney Dangerfield’s wife, Lea Thompson’s nosy next-door neighbor or preparing pasta primavera for forty people,” smiles the Brooklyn born Sicilian-American actress. She also starred in “Lovers and Other Strangers” on Broadway. Conley is a veteran of variety/comedy sketch writing and a tribute award show writer who cut his teeth at the tender age of 22 (in 1982) when he began his writing career with sketch comedy for TV legend Bob Hope. He is born and raised in LA, Jesuit educated, and a veteran Hollywood publicist who also served as Vatican Press Advance for Pope John Paul II and His Papal Mass at the LA Coliseum. “Azzara and Conley joined their talents to give you a quirky comedy look behind the scenes of working in Hollywood. They have written a comedic collection of short stories that will literally make you laugh-out-loud,” explains Gvili.